I have been doing Active Directory and Group Policy work for a while now and I have developed my own set of rules that I try to use where ever possible. So below I have written down all my rules in no particular order for you to go over and use for yourself. You may only chose to use only some of these rules or you might want to use them all depending on your circumstance. 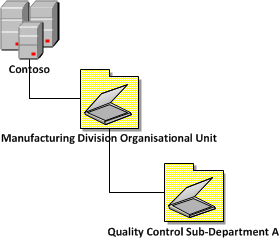 This is a two part series where I will first talk about designing you Active Directory Organisation Unit structure and then in part 2 (Best Practice: Group Policy Design Guidelines – Part 2) I will discuss some more ideas for applying Group Policy to the OU structure. I want to be clear that these are only guidelines and not rules that need to be strictly adhered to. In almost all case there are exceptions to these guidelines and you might even find your self implementing them in a hybrid approach. I intend for this web page to be updated on a regular basis as none of these rules are set in stone and thing obviously change all the time. When naming your Organisational Unit make sure the name you are using are short and to the point. There is technically nothing wrong with having long OU names but it is a pain to document and just leave you open to more chance of references then name wrong as their are more characters to type. Naming OU to something that is intuitive is good for new starters in the organisation. If you name a OU “OOG” a new starter in your organisation might not realise that this is the three letter international designation for Coolangatta AirPort which is the same suburb where your office is located. I know this is in conflict with rule 1 however it is also a balancing act your will have to carefully tread. OU structures in AD are hierarchical therefore you need make your design fit to this structure. When deciding how your want to organise your OU structure you are probably going decide to make it either organisational or geographical. This is most important when you are going to a Geographical design as it is a physical impossibility to have one location located in two difference cities,states,countries or regions. As a general rule you should only start creating another OU level if you are actually going to do something to that OU (e.g. delegate security or apply a group policy). Don’t be tempted to create an elaborate structure to organise you AD object if there is not reason to do so. 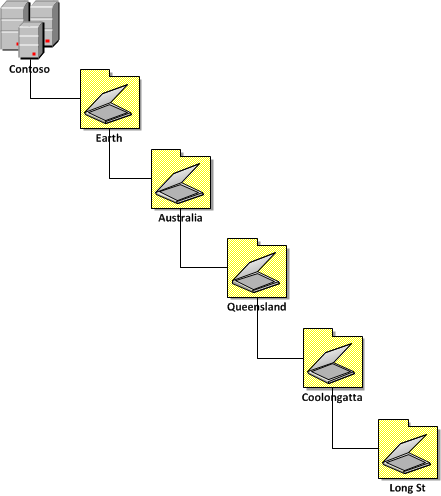 Having a deep OU structure also makes it very difficult to delegate security in the same delegating security on multiple folders deep to folder on a file share. 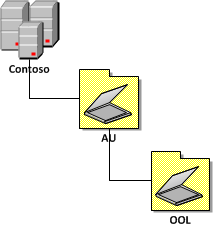 Don’t mix your terms when naming our OU Structure as this leads to confusion if for IT admins that leads them to believe that something might be different about the two OU’s where they actually contain the same type of objects. The example below shows how two different sites calls the OU for the computer in the organisation Workstations and Desktops. Hi Alan, great article – nice clean overview of this difficult subject. 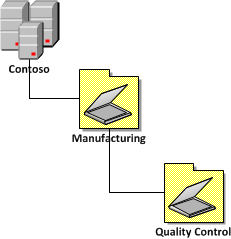 How did you create it – Visio? And how did you get the graphic elements used.. 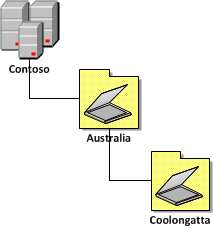 Need it to document our network-layout at work. I wanted to include some informtaion about the naming of OUs where it says :”When naming your Organisational Unit make sure the name you are using are short and to the point…” There may be technical limitations that may affect long names. 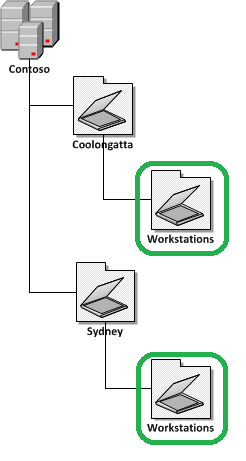 Best Practice: Active Directory Structure Guidelines – Part 1 http://t.co/LDCB4xuI via @alanburchill . useful as I am restructuring our AD. Thank you this is very much appreciated. I am working on a deployment for a organization with 4 distinct locations that includes a marriage to Apple OpenDirectory as well as FreeBSD OpenLDAP. Having a well thought out explanation like this is fantastic. It has helped me explain the complexities of designing the right solution to all members of the team. I still have not drafted the final plan but it is giving some great ideas so hopefully I can achieve this shortly. 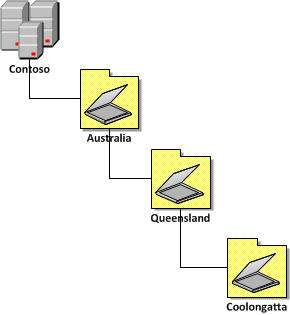 I’m new to Active Directory and this is very usefull. I have a question about the Resource Structure Example image sample above . the Groups OU contains Roles and Resources groups. Does Roles contains groups like Officers, Employees, etc? Pingback: GP MVP Activity UNI Data Inc.